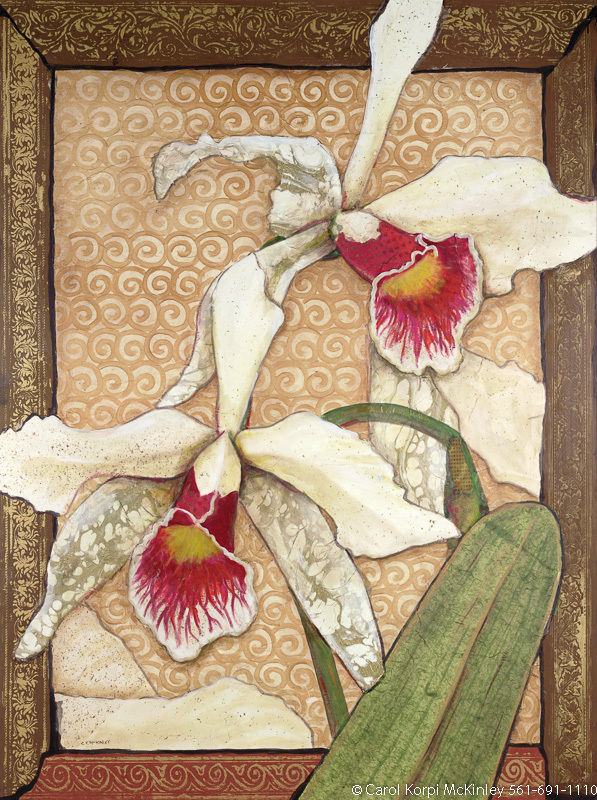 Two Orchids Paper Collage #PPR-013, Original Acrylic on Canvas: 65 x 87 inches $4950; Stretched and Gallery Wrapped Limited Edition Archival Print on Canvas: 40 x 56 inches $1590. Custom sizes, colors, and commissions are also available. 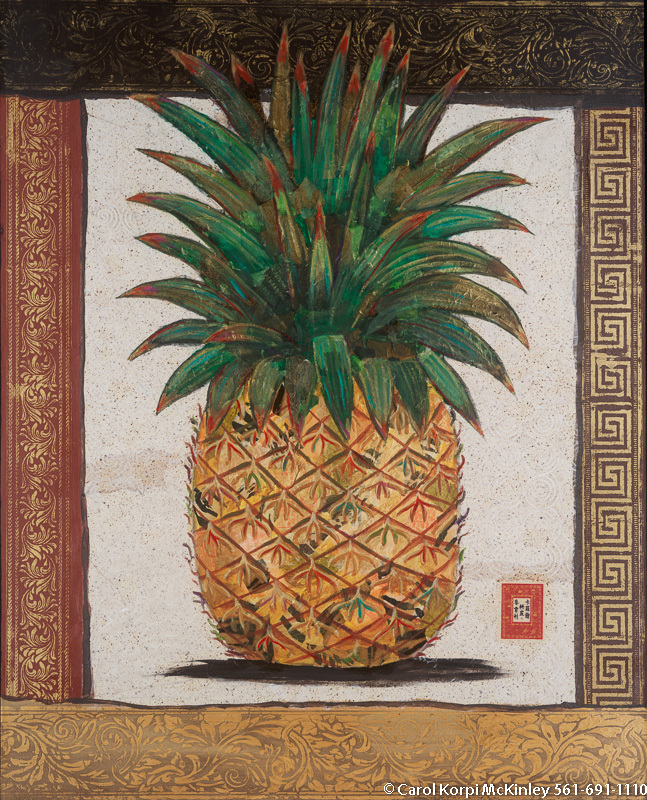 For more information or to order, please visit our ABOUT page or call us at 561-691-1110. 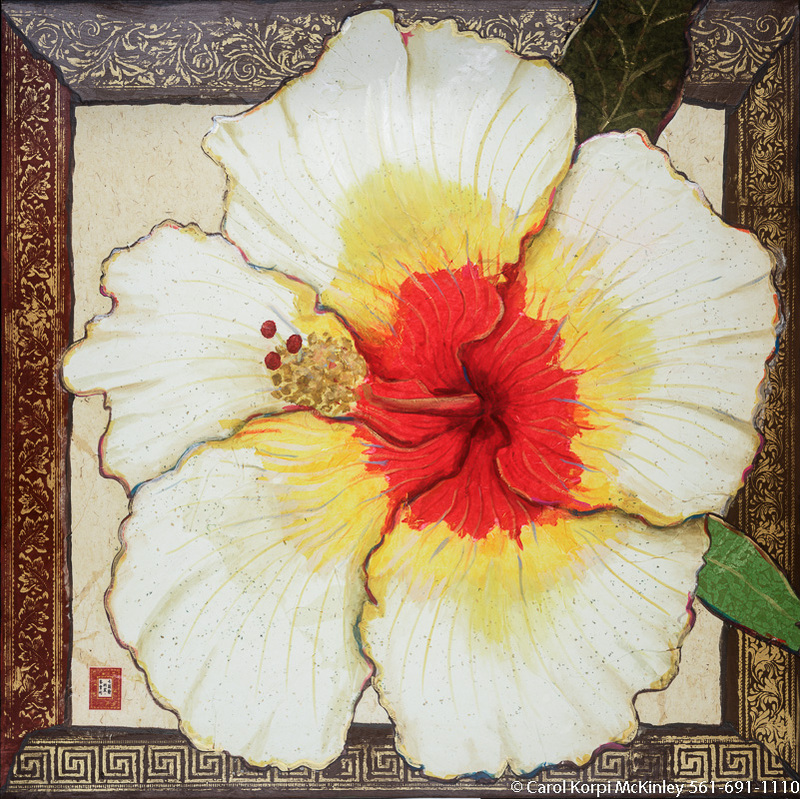 Hibiscus #PPR-016, Original Acrylic on Canvas: x inches, Sold; Stretched and Gallery Wrapped Limited Edition Archival Print on Canvas: 40 x 40 inches $1500-. Custom sizes, colors, and commissions are also available. For more information or to order, please visit our ABOUT page or call us at 561-691-1110. 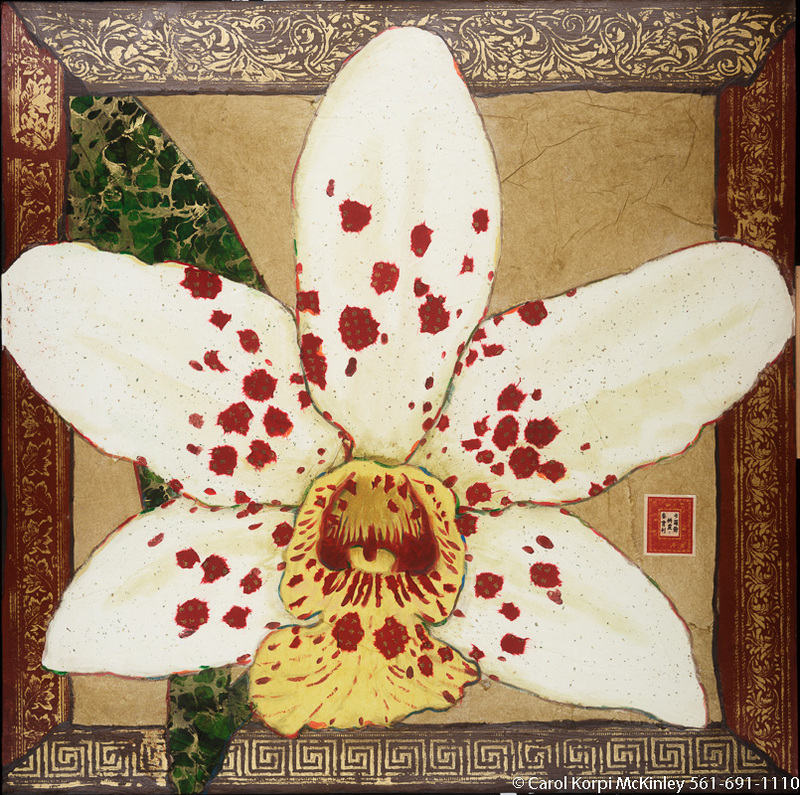 Orchid #PPR-014, Original Acrylic on Canvas: 65 x 65 inches, Sold; Stretched and Gallery Wrapped Limited Edition Archival Print on Canvas: 40 x 40 inches $1500-. Custom sizes, colors, and commissions are also available. For more information or to order, please visit our ABOUT page or call us at 561-691-1110. 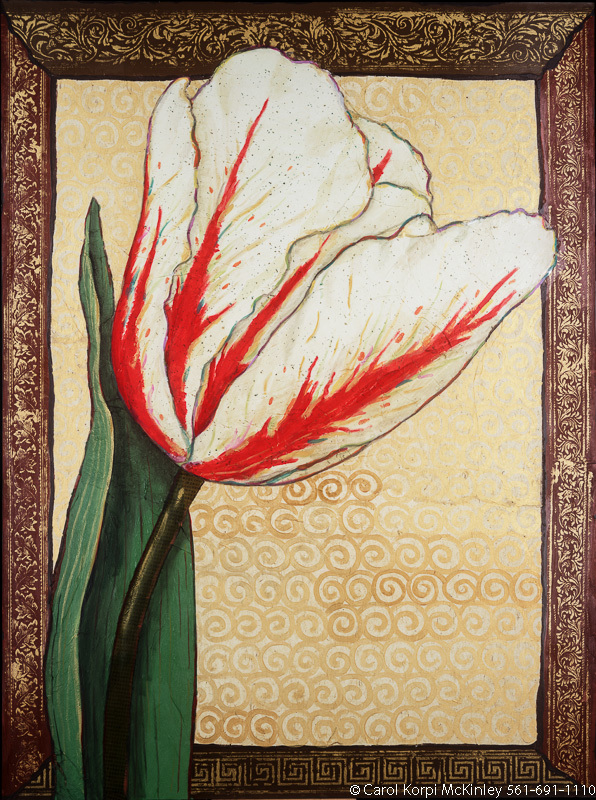 Tulip #PPR-002, Original Acrylic on Canvas: 48 x 60 inches $2400; Stretched and Gallery Wrapped Limited Edition Archival Print on Canvas: 40 x 50 inches $1560. Custom sizes, colors, and commissions are also available. For more information or to order, please visit our ABOUT page or call us at 561-691-1110. 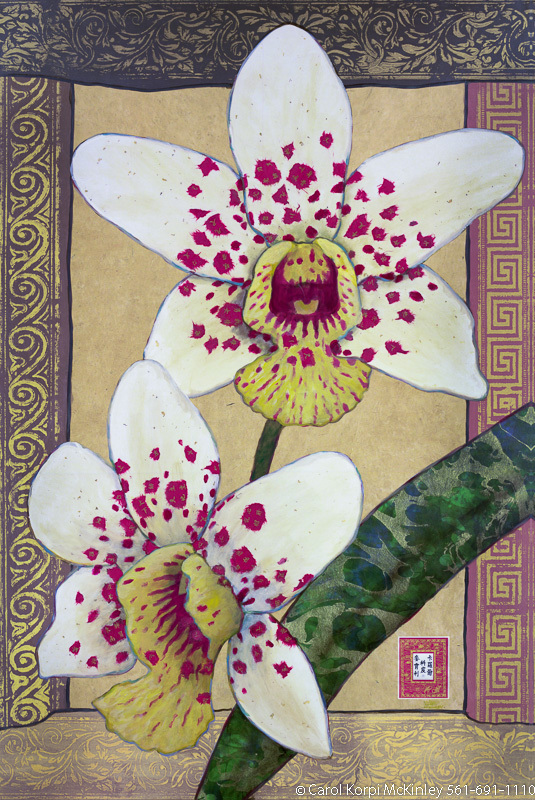 Two Orchids #PPR-041, Original Acrylic on Canvas: 40 x 60 inches $2550-, Sold; Stretched and Gallery Wrapped Limited Edition Archival Print on Canvas: 40 x 60 inches $1590-. Custom sizes, colors, and commissions are also available. For more information or to order, please visit our ABOUT page or call us at 561-691-1110. 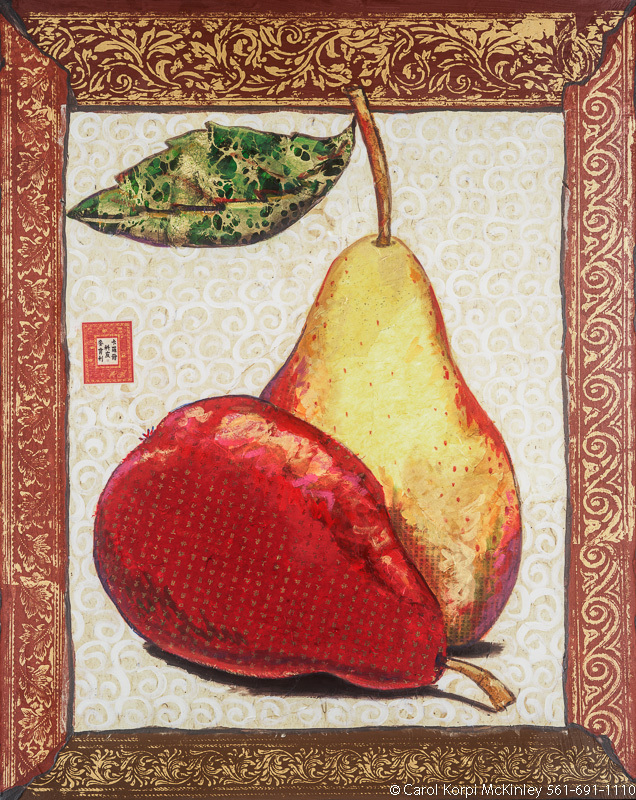 Two Pears #PPR-027, Original Acrylic on Canvas: 48 x 60 inches $2475; Stretched and Gallery Wrapped Limited Edition Archival Print on Canvas: 40 x 50 inches $1560. Custom sizes, colors, and commissions are also available. For more information or to order, please visit our ABOUT page or call us at 561-691-1110. 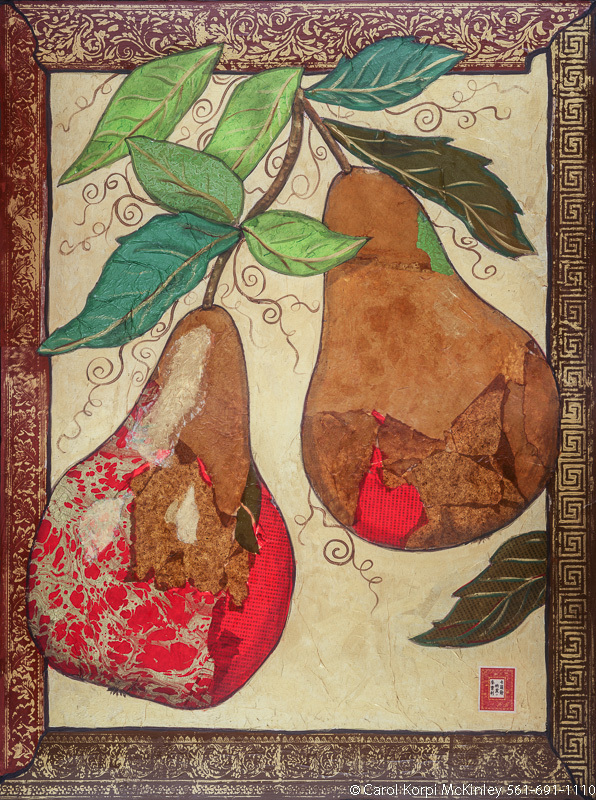 Two Pears #PPR-011, Original Acrylic on Canvas: 65 x 84 inches $4050; Stretched and Gallery Wrapped Limited Edition Archival Print on Canvas: 40 x 50 inches $1560. Custom sizes, colors, and commissions are also available. For more information or to order, please visit our ABOUT page or call us at 561-691-1110. 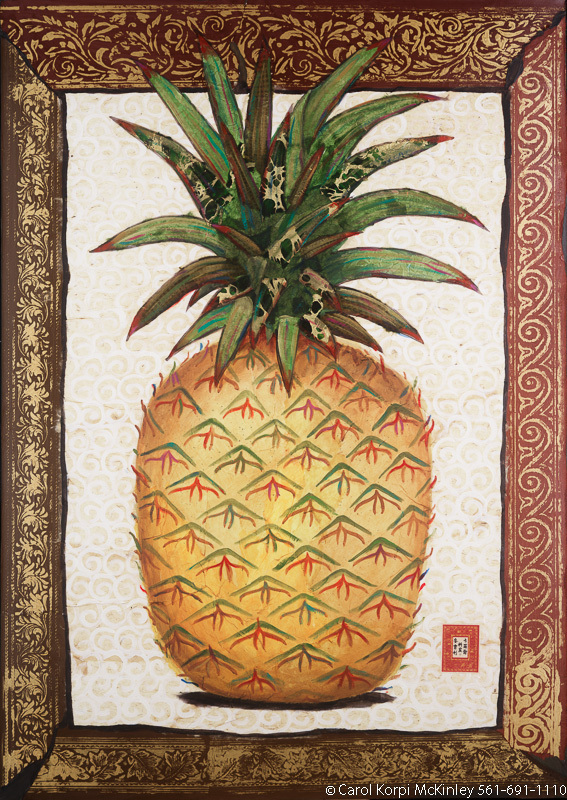 Pineapple #PPR-008, Original Acrylic on Canvas: 48 x 68 inches $2550; Stretched and Gallery Wrapped Limited Edition Archival Print on Canvas: 40 x 56 inches $1590. Custom sizes, colors, and commissions are also available. For more information or to order, please visit our ABOUT page or call us at 561-691-1110. 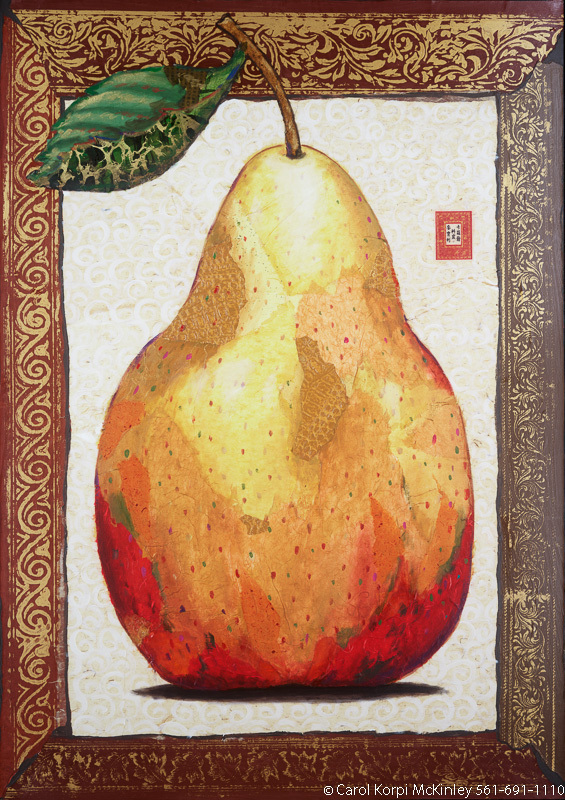 Pear #PPR-010, Original Acrylic on Canvas: 48 x 68 inches $2400; Stretched and Gallery Wrapped Limited Edition Archival Print on Canvas: 40 x 56 inches $1590. Custom sizes, colors, and commissions are also available. For more information or to order, please visit our ABOUT page or call us at 561-691-1110. 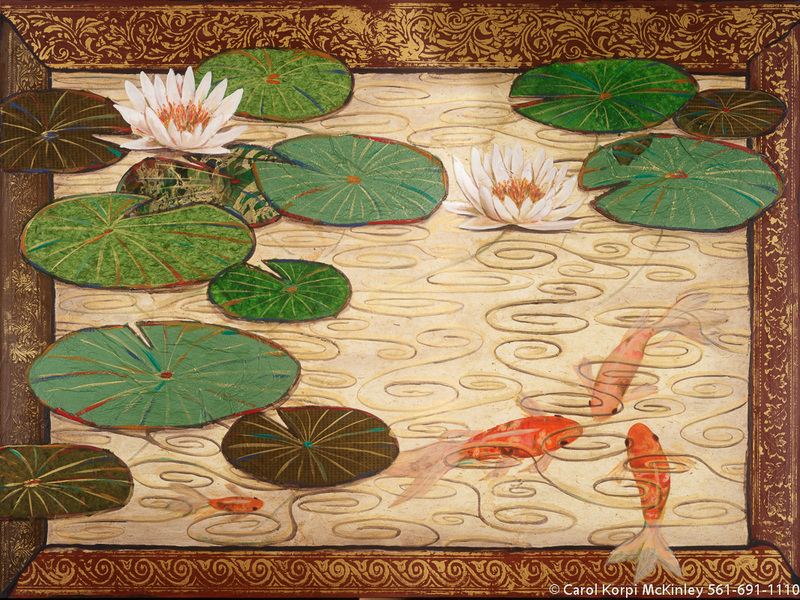 Goldfish Pond #PPR-017, Original Acrylic on Canvas: 72 x 96 inches, Sold; Stretched and Gallery Wrapped Limited Edition Archival Print on Canvas: 40 x 56 inches $1590-. Custom sizes, colors, and commissions are also available. For more information or to order, please visit our ABOUT page or call us at 561-691-1110. 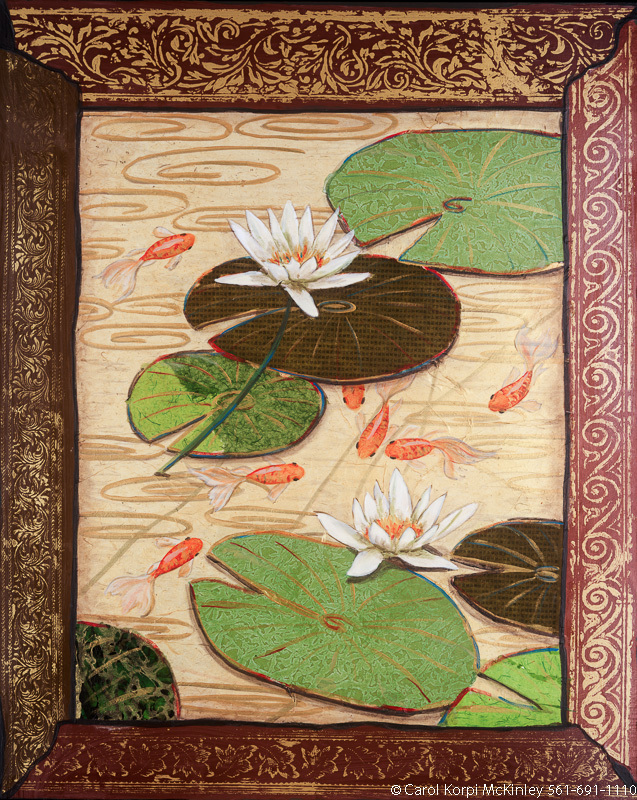 Goldfish Pond #PPR-018, Original Acrylic on Canvas: 48 x 60 inches, Sold; Stretched and Gallery Wrapped Limited Edition Archival Print on Canvas: 40 x 50 inches $1560-. Custom sizes, colors, and commissions are also available. For more information or to order, please visit our ABOUT page or call us at 561-691-1110. 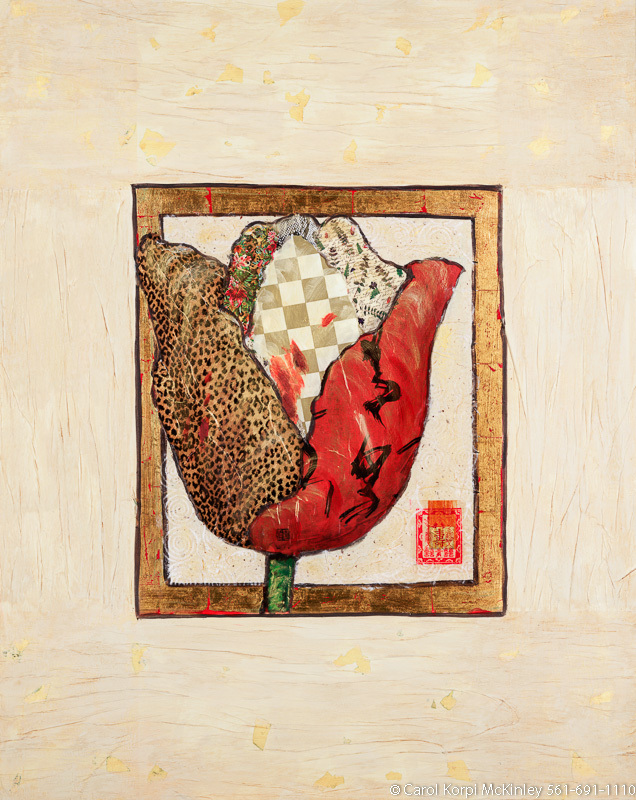 Tulip #PPR-015, Original Acrylic on Canvas: 65 x 86 inches $4050; Stretched and Gallery Wrapped Limited Edition Archival Print on Canvas: 40 x 56 inches $1590. Custom sizes, colors, and commissions are also available. For more information or to order, please visit our ABOUT page or call us at 561-691-1110. 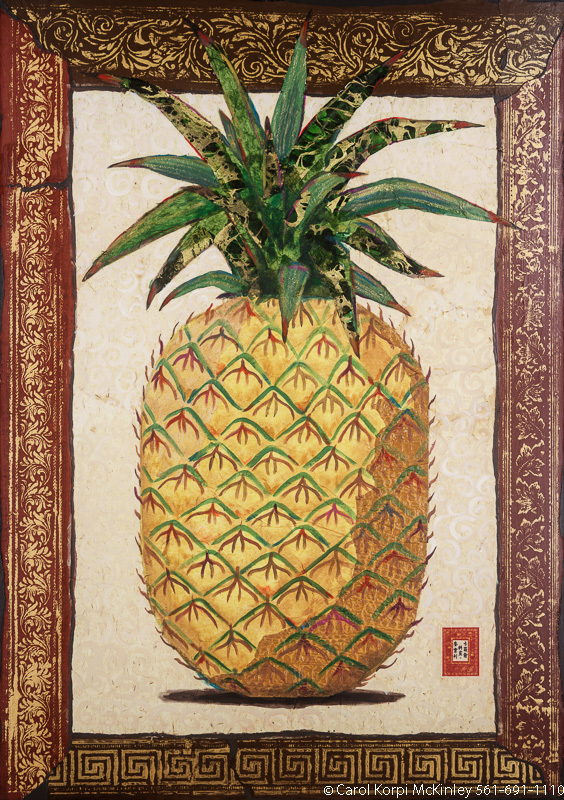 Pineapple #PPR-026, Original Acrylic on Canvas: 48 x 60 inches, Sold; Stretched and Gallery Wrapped Limited Edition Archival Print on Canvas: 40 x 50 inches $1560-. Custom sizes, colors, and commissions are also available. For more information or to order, please visit our ABOUT page or call us at 561-691-1110. 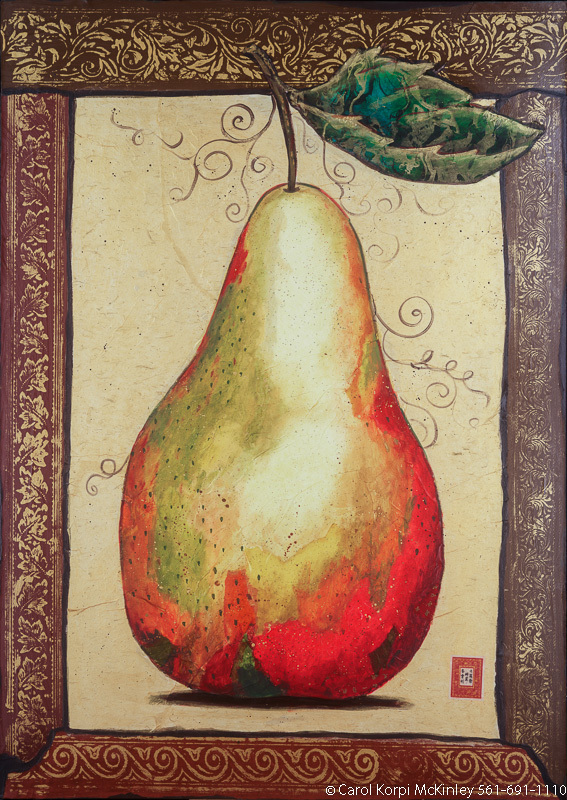 Pear #PPR-012, Original Acrylic on Canvas: 48 x 68 inches, Sold; Stretched and Gallery Wrapped Limited Edition Archival Print on Canvas: 40 x 56 inches $1590-. Custom sizes, colors, and commissions are also available. For more information or to order, please visit our ABOUT page or call us at 561-691-1110. 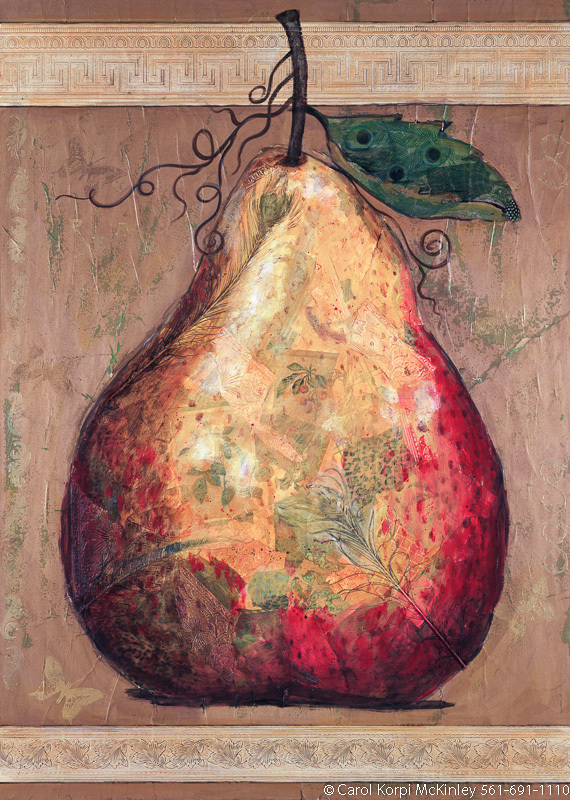 Pear #PPR-025, Original Acrylic on Canvas: 48 x 68 inches $4050-, Sold; Stretched and Gallery Wrapped Limited Edition Archival Print on Canvas: 40 x 56 inches $1590-. Custom sizes, colors, and commissions are also available. For more information or to order, please visit our ABOUT page or call us at 561-691-1110. 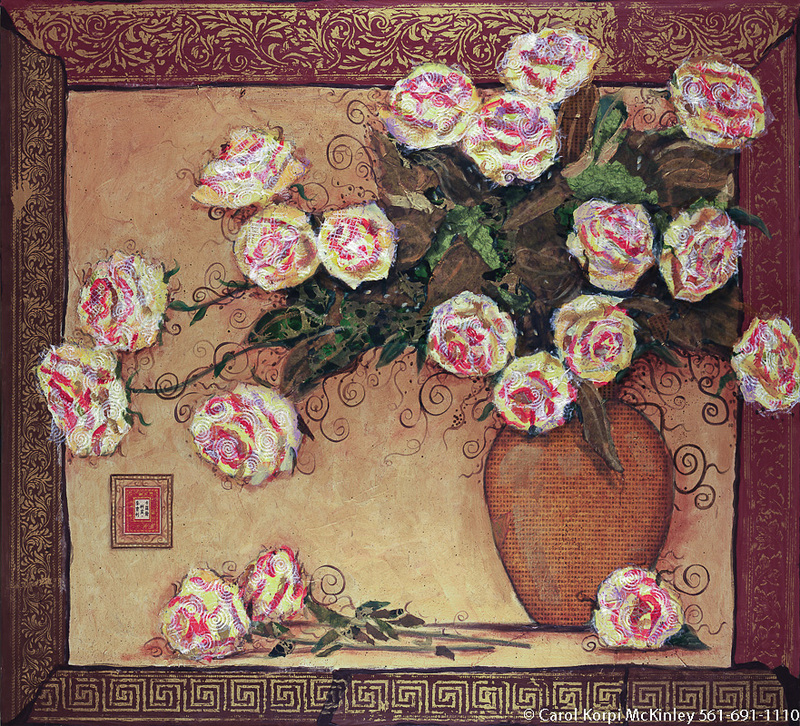 Paper Collage Floral Paper Collage #PPR-035, Original Acrylic on Canvas: 65 x 72 inches $4050; Stretched and Gallery Wrapped Limited Edition Archival Print on Canvas: 40 x 44 inches $1530. Custom sizes, colors, and commissions are also available. For more information or to order, please visit our ABOUT page or call us at 561-691-1110. 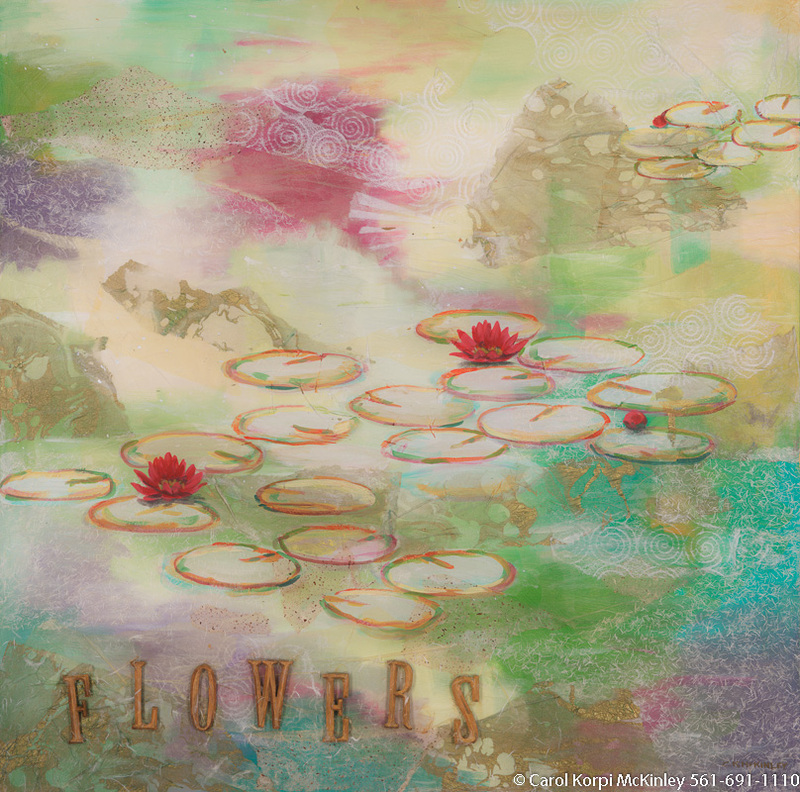 Lily Pond #PPR-028, Original Acrylic on Canvas: 48 x 48 inches, Sold; Stretched and Gallery Wrapped Limited Edition Archival Print on Canvas: 40 x 40 inches $1500-. Custom sizes, colors, and commissions are also available. For more information or to order, please visit our ABOUT page or call us at 561-691-1110.